That title sounds dirty, but it's not. My house is, though. I have been without my husband since Sunday morning, so not much has been going on but baby-pacifying and staying-alive stuff. Our Maytag Bravos washing machine (4 years old and $800 when we bought it) is completely broken and I'm about as irritated as it gets. Also, swimming in dirty laundry. Because I don't have to time to do Meryl and Chris' trip to our house justice in the form of a proper post right now, I thought I'd share a few pics of my Halloween instead. Sunday was our trick or treat. My bro dressed as Captain America, Ashford was a Sea Turtle! He didn't much like the headpiece, but he loved to 'flap his wings,' which I believe were supposed to be the turtle feet. They didn't much look like feet. It was cute. When you spend $40 on a Pottery Barn baby costume (thanks, mom!) you kind of want them to wear it for a while, right? We kept it on him as long as we could, but it ultimately got all uh, moist from his drool and so that was that. Captain America....the kids LOVED this! They could see him all the way down the street and were so excited to get to our house. He was hiding a beer behind his shield. I didn't actually hide mine, now that I think about it. Oh well, I'll be known as the heavy drinker of Russet Street. This is the only halfway decent picture of me and baby, this kid did not smile for a picture all day! Maybe I will dress him in the costume for Thanksgiving and try the photos again. Wasn't there a story about a Thanksgiving turtle? If not, there should be. PS - have you guys tried picmonkey? I'm obsessed with the 'Dusk' effect! SO CUTE!!! 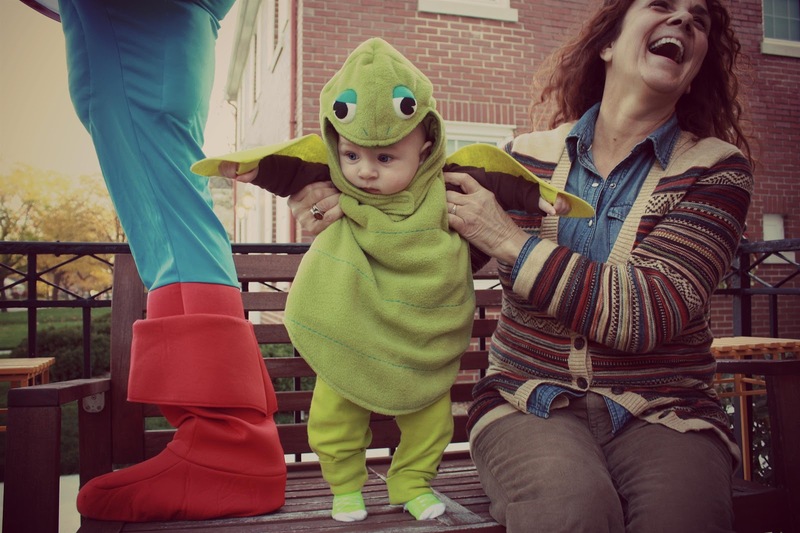 There is seriously nothing more adorable than a baby in costume, right? Adorable and WOW you look like your mom! He is so VERY CUTE!! Not just in that outfit. He is really just a beautiful baby. I've been known to be the "lady that drinks wine on her porch while passing out candy." I'm not ashamed to admit it. Ash is so cute. I love the costume and you look so pretty, momma. Also, the picture f your brother on the front porch is priceless. 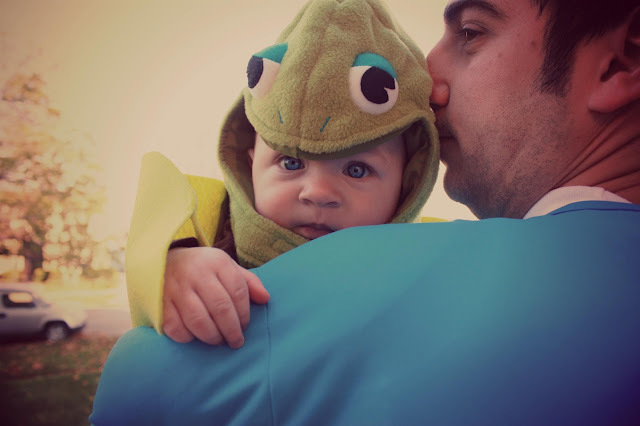 Looks like an awesome first Halloween for the littlest guy. He is SO handsome! Wow, the turtle costume is amazing. I can't believe how fast he's growing - and I can't wait to see the kitchen! Beer while handing out candy-guilty. Love that little sea turtle. You and your mom look so much alike! Pic monkey rocks!!! Could this comment be anymore random?? Happy belated Halloween, mama! 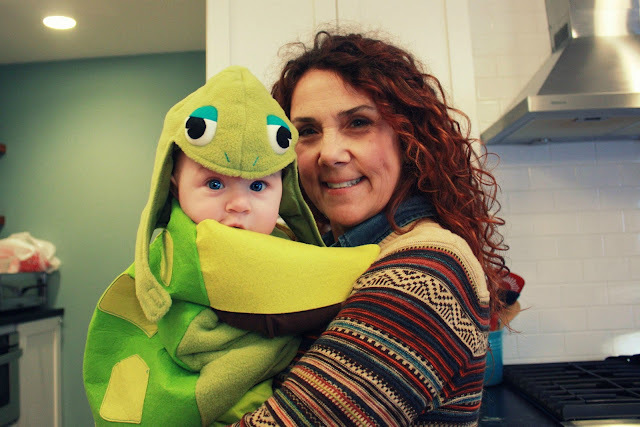 Pickmonkey is the bomb and your baby is adorable in his turtle costume! He reminds me of that turtle from Finding Nemo... Crush? I'm MIA for a few months and he's all grown up!! So cute!! he's getting SO big already! Ugh, and slaying me with his cuteness!!! I'm a bit obsessed with sea turtles... so this is a double dose!